Today I have an interesting story to tell you, along with a few facts, about how this bit of airline history unfolded. Panagra is the name of the airline and my story today tells about how this partnership airline opened up Latin, and South America, to the international community. Panagra was a joint venture between Pan Am and W.R. Grace Company. Pan Am was responding to a request to provide service south in to Latin and South America but knew there would be difficulty trying to compete with W.R. Grace who controlled the west coast of South America, through their steamship routes, and were not about to let some outsider into their territory—especially an airline. Juan Trippe knew that unless he could get Grace on board there were be no landing rights given to Pan Am for service into Grace’s territory. Pan Am’s negotiations with Grace culminated in the formation of Pan American-Grace Airways—Panagra—with fifty percent being owned by Grace and fifty percent by Pan Am. Now that you know how it all came about let’s talk about Panagra and at the conclusion of the article I will have some interesting facts that will reveal the rest of the story. Panagra provided air transportation for passengers, mail, and cargo over a 4,251-mile network of routes throughout Panama, Colombia, Ecuador, Peru, Bolivia, Chile and Argentina. Panagra, thus, had accomplished a pioneering job second to none. Less than a year after its inception, it had linked the Americas from the United States to Argentina with a direct, regularly scheduled passenger, mail and freight service. The trip from New York to Buenos Aires by plane could now be made in eleven days which was less than half the time it took by steamer. Panagra carried American aviation farther than it had ever been before. No other U. S. airline was operating over such great distances at that time; American aviation had barely begun to stretch its wings beyond its territorial boundaries with a few short routes through Central America and the Caribbean area. Panagra was the first airline in South America to develop and apply airways weather forecasts – and professional meteorologists furnish today all company planes with complete reports on the weather en-route and at destination at all hours. It was the first to adopt the controllable pitch propeller, first to use the revolutionary constant speed propeller, first to deploy a fully equipped radar fleet, and first to introduce the DC-6, DC-6B, DC-7 and DC-8 to South America. During its three and a half decades of serving the Americas, Panagra did more than carry passengers, freight, and mail. Time and again the airline’s planes were sent on missions of mercy carrying a vial of precious lifesaving medicine to a dying man, an iron lung to a girl’s stricken with polio, or a shipment of drugs to arrest the spread of an epidemic. In 1961 in Chile, and in 1948 in Peru, when earthquakes literally shook cities to pieces Panagra placed its entire facilities at the disposal of the stricken nations airlifting tons of medical supplies and food to the disaster area and flying out the victims. Panagra was an important factor in the economic and industrial development of South America. By stimulating an increased flow of trade and travel within the Hemisphere, the airline helped draw South America closer economically and culturally to the United States. From early 1943 until the merger with Braniff 25 years later there was only one Panagra aircraft lost in operations with no fatalities. A non-compete clause in the agreement between Pan American World Airways, Grace, and Panagra made Panama the northern end of Panagra’s route system. In those early days airports were unknown, radio facilities were nonexistent and meteorology, as we know it today, was unheard of. As routes were expanded and frequencies increased, the airline had to build its own airports, equip its own overhaul and maintenance shops and set up its radio and weather stations along the entire route. The History began on September 13, 1928, when a tiny single-engined Peruvian Airway’s Fairchild FC-2 monoplane with four passengers and a few letters took off from a racetrack in Lima and landed 550 mile away, in a soccer field in Talara, Peru. This was the inauspicious beginning of scheduled commercial air transportation along the west coast of South America and the start of Panagra (Pan American Grace Airways). 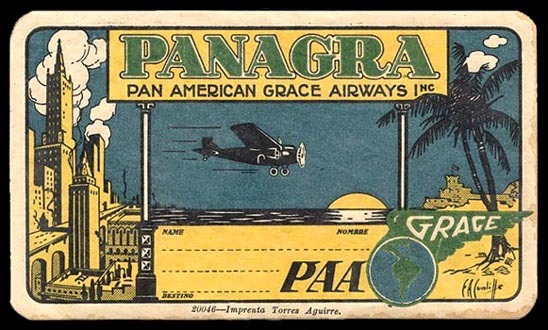 A few months later, with the backing of Pan American World Airways and W.R. Grace & Co, Peruvian Airways (founded by Harold B. Harris in 1928) became Panagra. Between 1929 and 1942, Harris held the positions of Vice-President and Chief Operations Officer. On October 12, 1929, a Panagra tri-motored Ford took off from the airport in Buenos Aires, cruised at a normal altitude over the flat pampas, and after stopping to refuel at Mendoza, Argentina, crossed the formidable Cordillera of the Andes through the Up Sallata Pass at the then unheard of altitude of 18,000 feet. Eight and a half hour after leaving the Argentine capital, the little Panagra airplane landed at Santiago’s Los Cerrillos Airport making the first commercial flight across the Andes. By 1930 Panagra planes had shortened the distance between New York and Buenos Aires to seven days, and two American airmen had written another stirring chapter in the colorful history of aviation. One of these men was Lloyd R. “Dinty” Moore, a Panagra pilot, who had made an “impossible” dawn to dusk flight between Peru and Panama to deliver the mail on schedule to another pilot who flew it from there to the U. S. The other pilot was Charles A. Lindbergh. Scheduled airline service between the Americas was now an accomplished fact. Lindbergh and Moore had proven it could be done. Panagra planes were cruising up and down the Hemisphere on a once-a-week schedule. With incredible speed the service was further expanded. More planes were put into operation. New routes were inaugurated. Other cities in Ecuador, Peru and Bolivia were quickly linked with the main trunk line along the west coast of South America. Just before Pearl Harbor, when war with the Axis was imminent, Panagra, with the assistance of the respective South American governments and at the request of our own State Department, first paralleled and then replaced the services of German controlled SEDTA in Ecuador and Lufthansa in Peru and Bolivia, This was designed to avert an economic and transportation crisis and remove the Nazi threat from this continent. In 1942, due to the need to move heavy freight, in support of the war effort, Panagra converted a couple of its DC-3’s into freighters. Panagra started the first all-cargo route of any American flag airline when it inaugurated a route between the Canal Zone in Panama and Lima. Following the war the pioneer U. S. airline was able to obtain the larger, faster four-engined aircraft needed to inaugurate night operations and eliminate overnight layovers on its route. Panagra’s DC-3’s, 4’s and 6’s featured broad yellow stripes on the wings. These stripes were to help in locating a plane that went down in the rugged terrain. In the first 15 years of operations the safety record was comparable to US domestic operations under significantly more challenging conditions. From early 1943 until the merger with Braniff 25 years later there was only one Panagra aircraft lost in operations with no fatalities. Indeed as the Panagra pilots continued their careers with Braniff and other airlines after the merger, not one life was lost with a Panagra pilot up front! By 1946, elapsed time between Panama and Buenos Aires had been shortened to less than 24 hours. With the entry of Braniff International into the Latin American market, Panagra’s started to fly to Miami and New York in the 1950’s. While this provided through plane service, north of Panama these were actually Pan American flights using Panagra planes and crews to Miami and National Airlines on up to New York. By May 1960, Panagra had introduced DC-8, jets to cut travel time between New York and the Argentine capital to less than 12 hours flying time. 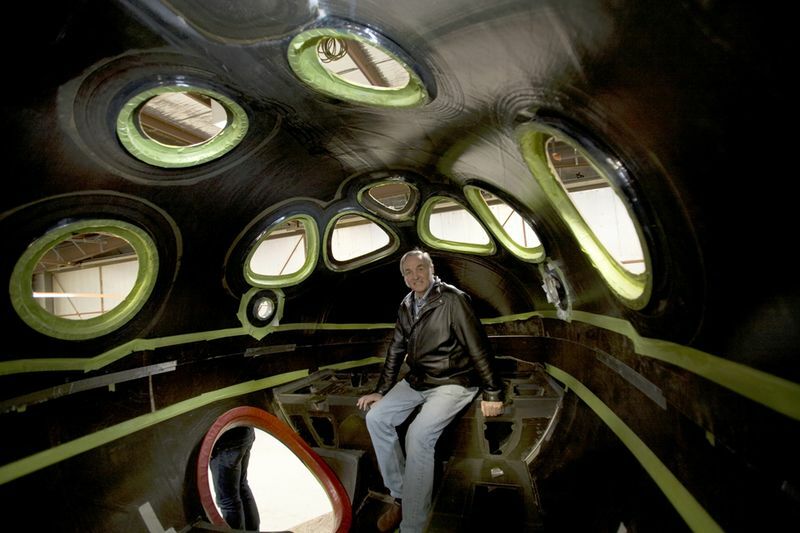 In developing air routes where none previously existed, Panagra had to start from scratch. Its intercontinental DC-8 jet service linked Buenos Aires, Santiago, Antofagasta, La Paz, Lima, Guayaquil, Quito, Cali and Panama City with Miami and New York. 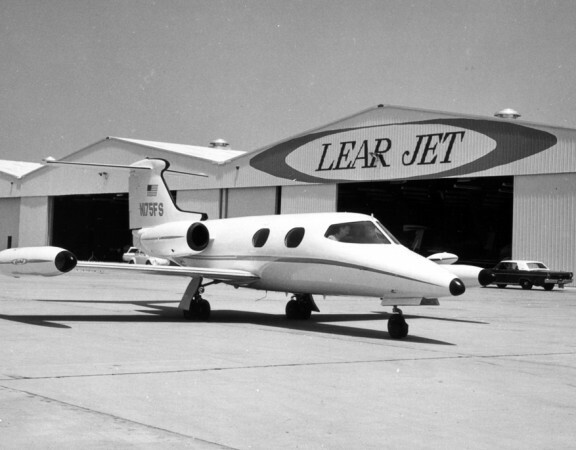 These 585-mile-an-hour jet planes accommodated 24 first class and 94 tourist class passengers in spacious and comfortable cabins that were equipped with bed sized berths, a Fiesta Lounge and a snack bar. Braniff began negotiations to purchase Panagra during the Charles Beard administration. Negotiations were later renewed and in December of 1965, a deal was made for the purchase of W.R. Grace’s 50% interest. The deal was concluded on March 17, 1966 when the remaining 50% interest held by Pan American World Airways was acquired. 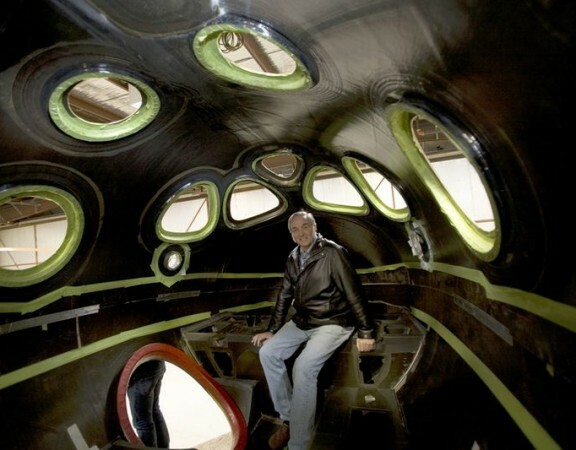 This time however, the offer for the airline was raised to $30 million from the original $8 million offer. 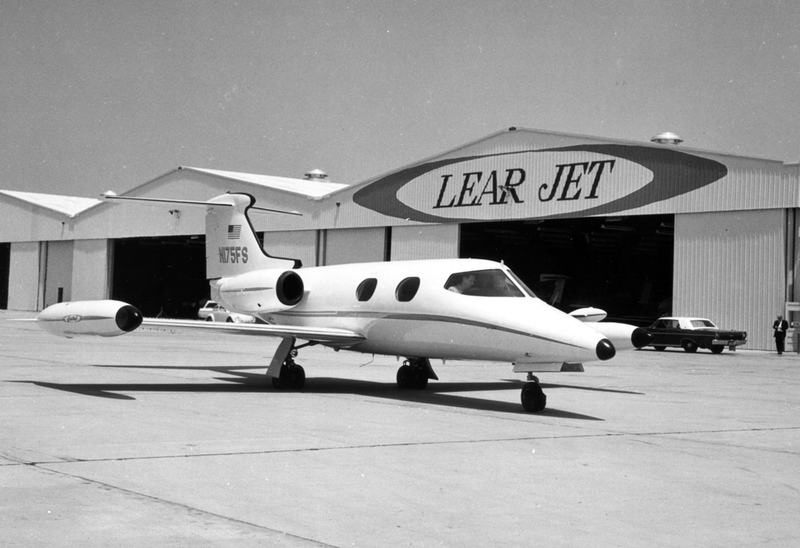 In July of 1966, the Civil Aeronautics Board approved the plan and President Lyndon Johnson allowed the merger to proceed. The merger and integration of Panagra’s operations was completed on February 1, 1967. 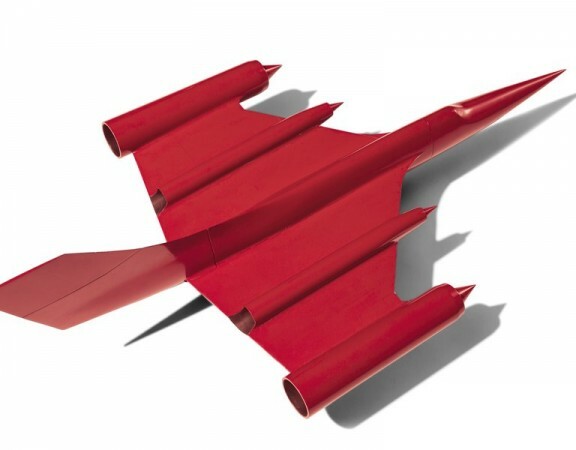 Braniff acquired Panagra’s fleet including DC-7’s, DC-8-31’s and 55F’s, as well as purchase orders for five long-range intercontinental McDonnell Douglas DC-8-62 aircraft. Braniff went broke in 1982. Apparently someone thought it a good idea to start again, under Panagra name. So in 1996 operations were restarted from Fort Lauderdale, FL. using the Boeing 727. Panagra ceased operations (again) in 1999. 1. By 1926 the Germans had started to fly into almost every South American Country. There was a real concern that they would operate through the Canal Zone and pose even a greater threat to U.S. National Security. The U.S. Government let it be known that they were ready to award mail routes to anyone that could fly Central American and South American routes. NYRBA —New York, Rio, and Buenos Aires— purchased four flying boats and had them in Rio, ready to initiate a service on the East Coast of South America. Richard Hoyt, Juan Trippe and their attorney, “Wild Bill” Donovan were scrambling around trying to get together a consortium to fly these routes, with a bunch of Yale men that were world war one pilots. The route bids went out. Trippe had no aircraft, no crews and bid $2.35/mile. NYRBA had aircraft and crews, but when they went to negotiate landing rights, they ran into trouble with the local governments. Yes, the Secretary of State was a Yale man, as was the Post Master General who awarded the routes to Pan Am. 2. SCADTA (Sociedad Colombo-Allemán De Transporto Aéreo — Colombian-German Air Transport Corporation) was the first commercial airline in the western hemisphere. It began operations in Colombia on October 19, 1920. It was the product of German businessmen, war surplus airplanes and personnel from the World War I Luftwaffe along with Colombian capital. By the end of 1920 SCADTA had an exclusive airmail contract with the Colombian government. The contract, which lasted eleven years, included the right to print and sell their own SCADTA airmail stamps. Interestingly, it was SCADTA’s aggressive expansion throughout South and Central America during the 1920s that led to an appropriation by the U. S. Congress to provide funds for the Post office to subsidize domestic and foreign air transport expansion in 1925. This was the Kelley Bill, the Air Mail Act of 1925. 3. Pan American Airways secretly owned a major part of SCADTA which it had acquired during the early days of the depression with help from the U. S. Secretary of State. This ownership led to PAA ownership of 65% of AVIANCA which was formed from SCADTA when it was nationalized by the Colombian government of President Dr. Alfonso López in 1934. Next week I will have another post on Panagra but it will be a narrative of a personal story by a pilot who was there, flew the routes, and lived the life of a Panagra pilot. Until then I wish the best to you and yours, take care, and be safe.